હવે વર્ડપ્રેસ ગુજરાતી બોલશે. It was great experience as General Translation Editors (GTE) and Translation Contributors. I have started use of WordPress in Gujarati language on one of my blog. Thanks to all contributors. 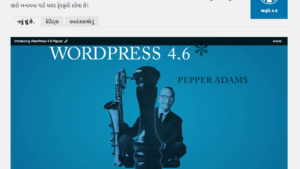 Gujarati is my native language, So it always feels good to stay connected with it and WordPress gave me that opportunity. Now, we will continuously improve the Gujarati translation so people who can’t speak or read English can use WordPress easily.